Today I’m so delighted to welcome the lovely, talented Amanda Francey to my blog. I just adore Amanda’s work, and can always tell her beautiful and distinctive style anywhere. With Christmas not so far away (yikes, where did this year go?! ), now is the perfect time to start checking out picture books revolving around the holiday theme. 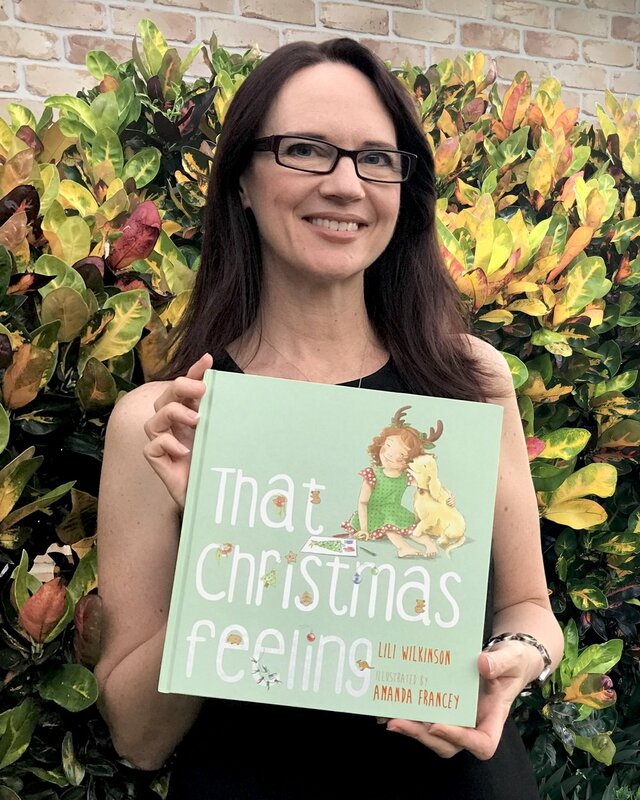 Today, Amanda lets us in on the beautiful book that she illustrated, That Christmas Feeling (published by Allen & Unwin), as well as some of her inspirations, processes, favourite books, and more. Welcome Amanda! Can you tell us a bit about your book, and the themes/issues it explore? That Christmas Feeling is a heart-warming story about misplacing the Christmas spirit, and finding it again. Empathy, resilience and gratefulness have been delicately woven in by the author, Lili Wilkinson. Dottie, her brother Jem, and their dog, Shortbread, are staying with their grandparents on Christmas Eve. Dottie’s waiting for the Christmas feeling to arrive. She reminisces of past Christmases at home with her parents, where everything was fizzy and magical. Grandma and Grandpa are trying hard, but it’s just not the same. Jem continues to reassure Dottie, but as the sky darkens, he feels that he’s let his little sister down. I hope readers will relate to Dottie’s and Jem’s experience, and connect it to a time in their own lives, when they felt disappointed or apprehensive about change. Jem and Dottie eventually discover they have a choice in how they react to the situation. They can remain disappointed, or they can create their own special experience by making the most of what they have – each other, and a beautiful night garden. Hopefully the reader will gain a sense of empowerment from seeing this perspective and applying it to their own life’s challenges in the future. Generally my work is influenced by observing life around me, my children and memories of my own childhood. From funny things children do, to the endearing way they position their feet. I love to bring all their little quirks to my illustrations. While I was reading through Lili Wilkinson’s manuscript for the first time, I immediately saw Dottie wearing reindeer antlers. I remembered my own daughter wearing her reindeer antlers as early as November during her excited anticipation of Christmas. This idea developed in my mind as I continued reading the manuscript, which lead to my illustrating a sub-story of Dottie and her reindeer antlers. I’m also influenced by style. I observe the work and styles of artists I admire and I pay attention to which style suits what project. The subject or story I’m working on will influence my chosen illustration style. In That Christmas Feeling, I drew my characters a little more realistically than I usually do, to reveal detailed facial expressions. I felt this would help the reader connect on an emotional level. Biggest challenges (and/or surprises) in illustrating this story? For me, the reworking of pages 24/25 was the most challenging in the book. I wanted to show a hint of the car, using the car lights to create a large white, text area in the middle of the spread, and I was asked to reduce the amount of detail in the background for more character focus. While I do most of my drawing digitally these days, sometimes I still find it easier to use pencil on paper to rough out my ideas. After much perseverance, this turned out to be one of my favourite spreads. Are there any tidbits from the publishing process of this book that you could share with regards to working with the publishers and/or the author? While working on That Christmas Feeling, I only dealt directly with an editor from Allen and Unwin and had no communication with the author, which is pretty standard in most publishing houses. 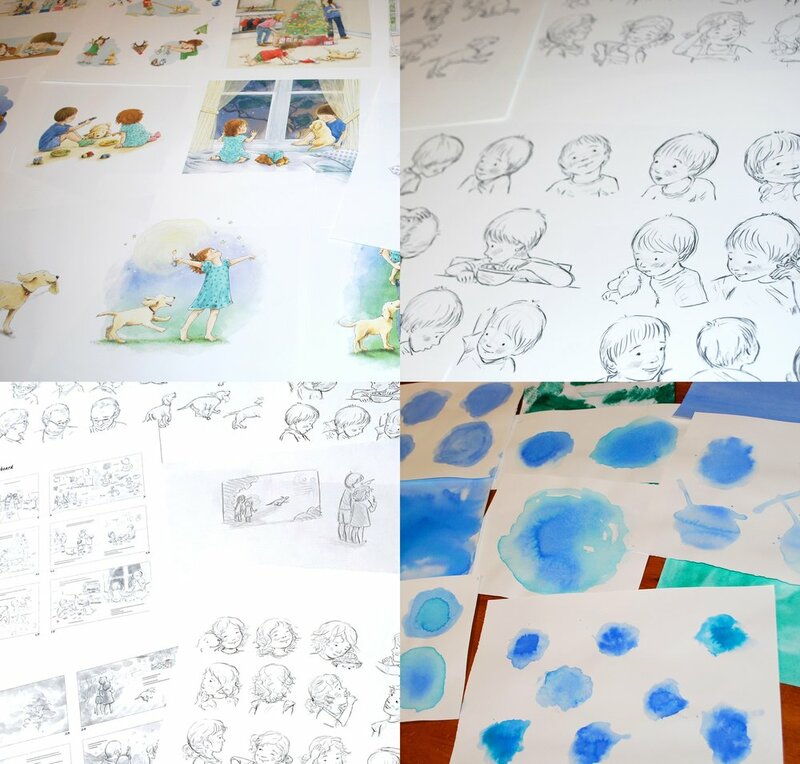 Lili’s manuscript was still developing as I was beginning the storyboard and characters, which was an exciting experience for me as the illustrator. It’s not often I have the opportunity to be part of the process so early on. I’m currently taking some time out from illustrating children’s books to focus on my health. I’ve been chronically ill for the last five years with multiple autoimmune diseases and Myalgic Encephalomyelitis (commonly known as Chronic Fatigue Syndrome or ME/CFS). I recently took a downward spiral and I’m slowly climbing back up again. When my health is stronger, I plan to continue working on my own stories and illustrations, without the pressure of publishing deadlines. I’m very much looking forward to working on personal projects, even if it has be much slower than I’d planned. Over the last couple of months (on my better days), I’ve gradually compiled some art goodies from That Christmas Feeling for The Literature Centre’s Book Exhibition, which will be held in Term 4, 2018. My bookshelves at home are overflowing with my favourites! Whenever I’m asked this question, usually one book springs to mind first, but it’s not always the same book. It tends to be a book that relates to me, or my children at the time. Right now, I’d have to say the book that stands out is Spirit, written by Cherri Ryan and illustrated by Christina Booth. When I read this book, I could relate it directly to my life at this moment. It’s an inspiring reminder, if we keep trying, we will sail again. 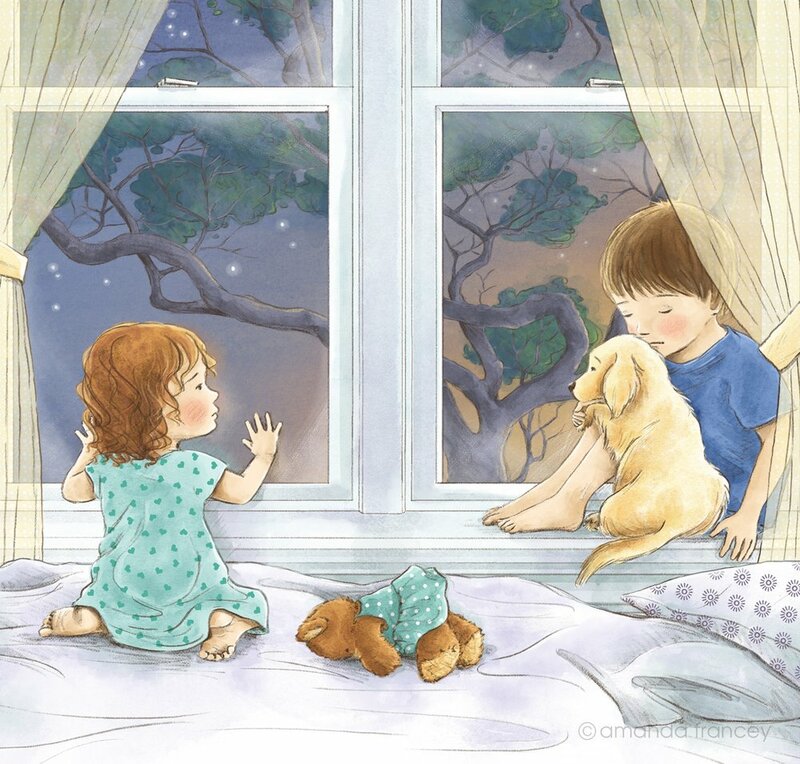 And Christina’s illustrations make my heart melt. I didn’t pick up a pencil for almost ten years after completing my art college degree. I guess I was too busy being in my 20’s. My childhood dream of creating children’s books had always been in my future plan. Even while my life was heading in other directions, children’s books had remained on my bucket list for when the time was right. I started illustrating my very first children’s book, the year my youngest child started primary school.